Karte von der Insel St. Lucia. 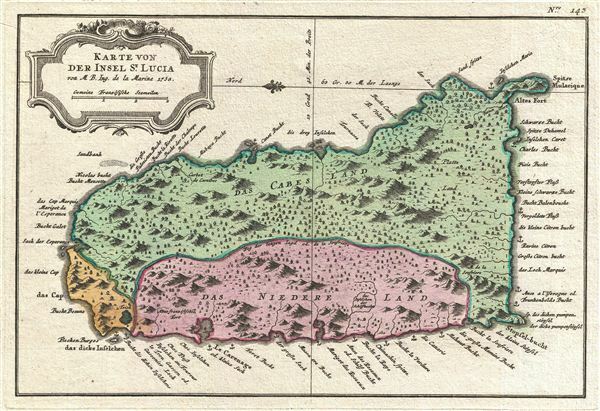 An exceptionally fine example of the 1758 Dutch edition of Jacques N. Bellin's map of St. Lucia (St. Lucie), in the Lesser Antilles, West Indies. Oriented to the east, this map covers the entire island of St. Lucia with topography rendered in profile and color coding according region. A Dutch language title cartouche in the rococo ethic decorates the upper left quadrant. Historically St. Lucia was part of the French West Indies, though, as this map went to press, the British, from their base in nearby Barbados, were eyeing the island's well developed sugar plantations. Several naval battles followed leading to a brief period of British rule in which African slaves were introduced to the island. Shortly thereafter the French once again asserted control of the Island and dominated the region until the events of the French Revolution. Today St. Lucia is a popular tourist destination and considered one of the most beautiful of the Windward Islands. This map was prepared by J. N. Bellin for issue in the 1750 edition of Provost's L'Histoire Generale des Voyages. The present example is from the 1758 Dutch language edition published in Amsterdam. Though issued later than the French edition, the Dutch edition is highly desirable for its higher quality paper, incorporation of period color, and superior fully re-engraved map plates. Provost, A., L'Histoire Generale des Voyages, (Amsterdam, Arkstee and Merkus), Dutch Edition, 1758. Harvard Map Collection, G5110 1758 .B41.